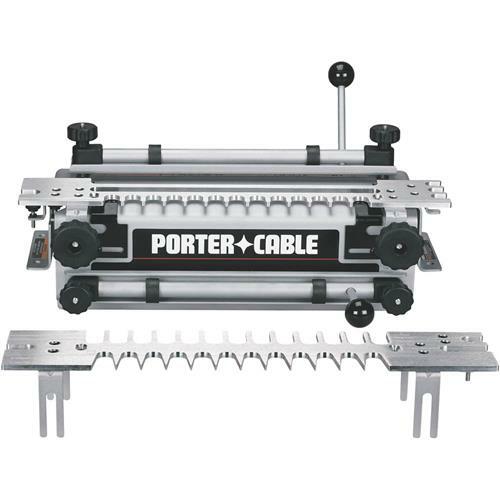 Heavy-duty and easy-to-use are perfect descriptions of the Porter-Cable 4212 dovetail jig. A 1/8" thick steel base along with CNC machined aluminum templates give this jig the strength and precision you would expect from Porter-Cable. Patented wood alignment lines along with a patented router bit depth stop make setup a breeze. The 4212 will cut through dovetails, box joints, half-blind dovetails, rabbetted half-blind dovetails, and dovetail dadoes (sliding dovetails). Accommodates stock from 1/4" to 1-1/8" thick. I did not buy this from Grizzly, but I have one and I love it!! !